iStockEmerging markets could be hit by a domino effect. 1. The ASX is set to open lower after US stocks tumbled overnight. It came after Chinese tech giant Tencent reported its first profit decline in almost 13 years, putting pressure on the mega-cap US tech firms that have led the market higher in recent months. 2. The USD continues to strengthen against other emerging market currencies, posting strong gains against the South African rand and Mexican peso. That saw the US dollar index briefly rise to a 14-month high. Now analysts are concerned that a currency crisis in Turkey could lead to a “rapid appreciation” in the dollar which could cause a domino effect across emerging markets. And, according Business Insider’s Jim Edwards, the crisis in Turkey is only just beginning. 3. 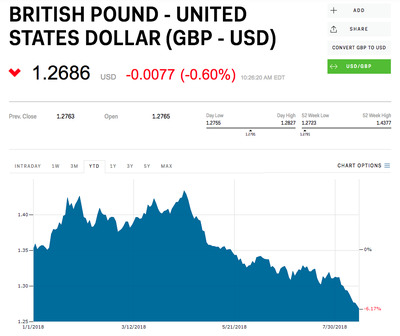 With the dollar on the rampage, the British pound is on its worst run since the financial crisis — and it’s only going to go downhill. After a strong start to 2018, the pound has slumped in recent months and is trading below $US1.27 for the first time in 14 months on Wednesday. Sterling hit a low of $US1.2669 during mid-morning trade. If the pound remains at this level, it will mark 11 consecutive days of losses against the dollar. Here are the three separate drivers of recent weakness, according to ING currency strategist Viraj Patel. 4. It’s jobs day: Monthly employment data for July will be released by the ABS at 11:30am AEST. The median forecast is for another 15,000 jobs to be added after last month’s huge 50,000 increase, with the unemployment rate holding at 5.4%. 5. IT’S OFFICIAL: Goldman Sachs is advising Elon Musk on his plans to take Tesla private. In a note to clients Wednesday, Goldman Sachs said it was removing price targets and stock ratings for Tesla because it is acting as a financial advisor “in connection with a matter that is fundamental to the reasonable analysis of the rating and price target for the stock.” It’s still unclear if there was a formal agreement when Elon Musk tweeted about working with the Wall Street firm. Meanwhile, Tesla shares sank by as much as 4% overnight on reports that the US Securities and Exchange Commission had issued formal subpoenas to Tesla. 7. More than 560 firefighters are battling more than 80 bushfires across NSW. Thirty-two of those fires remain uncontained this morning. The worst blazes were in Ulladulla and Bemboka. Last night the RFS said all fires across the state are now at a watch and act alert level and has advised residents in the affected areas to monitor conditions. “With no rain on the forecast many of the fires likely to burn over the coming days,” it said. 8. Rescuers in Northern Italy worked through the night to find survivors after a massive highway bridge collapsed on Tuesday morning in Genoa, killing 39. At least four people were pulled from the rubble alive after rescuers heard their voices under the carnage. Authorities are holding out hope for more survivors. Here’s a video of just one of the dramatic rescues of a victim who was saved from a crushed vehicle dangling above the ground. 9. Telstra’s full year profit is down 9% to $3.53 billion as Australia’s biggest telco faces “times of enormous challenge and change”. Revenue was flat and total income was just 3% higher at $29.04 billion. The telco expects this to shrink further this year. Telstra says the roll-out of the nbn network, shrinking margins in the fixed-line market, and increasing competition in the mobile market have influenced its performance. The result follows the launch of the telco’s 5G network on the Gold Coast yesterday. It’s the first telco in the country to roll out the next general mobile network. BONUS ITEM: This guy saved enough at age 28 that he’ll be a multimillionaire by retirement — here’s the Warren Buffett investing strategy he used to do it.